Watches tell the time, all the time, helping you stay on track and make quick decisions at a glance. That’s why Android Wear supports always-on screens and always-on apps. You get the info you need as long as you need it, while saving on battery and avoiding arm twists just to wake your display. Bring! Shopping List in normal and always-on modes. Going out for a run? Now, you can keep an eye on distance and pace just by glancing at your watch with Endomondo, MapMyRun, and Runtastic. If golf is more your game, Golfshot gives you accurate distances from tee to pin so you can always grab the right club from your bag. Competing in your personal weekly supermarket sweep? No need to slow down to bring out a list or phone. Just glance at your watch to see what’s next with Bring! Shopping List and Google Keep. And if you’re catching a flight, apps from American Airlines, Delta, and KLM show you flight status, gate, and seat info right on your wrist. Wearing your boarding pass keeps your phone in your bag and out of the airport lost and found. With a wide range of Android Wear watches available in the Google Store, it’s easy to find a watch that matches your personal style. No matter which watch you choose, you’ll always be able to stay on track by keeping important info on your wrist. Need some music right now to make whatever you’re doing better? If you’re not already a Google Play Music subscriber, we’ve now got you covered. Google Play Music now has a free, ad-supported version in the U.S., giving you a new way to find just the right music and giving artists another way to earn revenue. In less time than it takes you to read this sentence, you could be exercising with Drop-a-Beat Workout, cooling off with Poolside Chic, or spending quality time with Songs To Raise Your Kids To. , fashion is equal parts physical and digital. Now, in addition to our growing collection of watches, you can also pick from 1500+ downloadable watch faces to match any outfit, mood, or occasion. So whether you’re into games or glamour, you’re sure to find a watch face that lets you wear what you want. Ever wish you could change your look throughout the day? 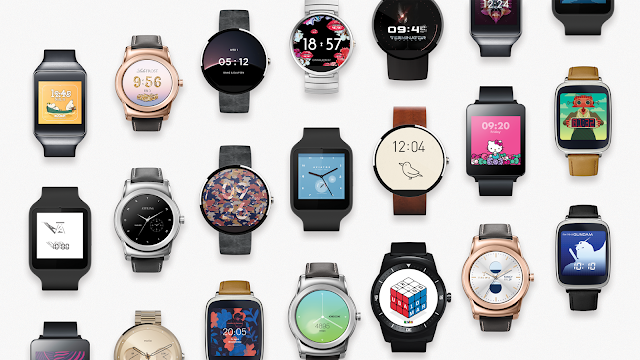 With Android Wear, fashion is equal parts physical and digital. Now, in addition to our growing collection of watches, you can also pick from 1500+ downloadable watch faces to match any outfit, mood, or occasion.